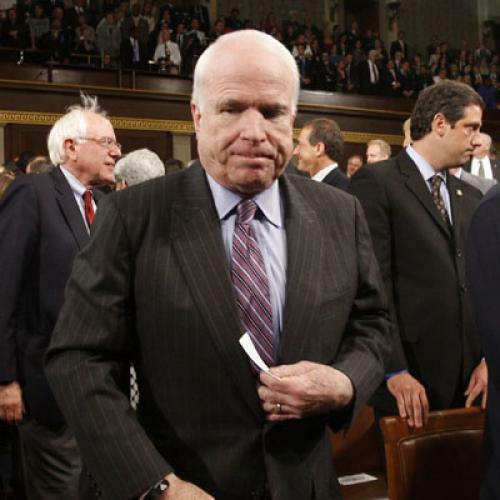 John McCain doesn't sound too thrilled with the new Kerry-Boxer climate bill. In fact, he doesn't seem too keen in crossing the political aisle at all these days—CQ noted that his voting record this session is on track to be the most partisan of his career. But when it comes to climate change, his recent about-face is especially odd. McCain was, after all, an early champion of cap-and-trade, sponsoring climate bills in 2003 and 2005. But this time around, instead of working with Democrats, McCain's been tweeting that, for instance, Waxman-Markey "appears to be a cap & tax bill that I won't support." First, it's possible that McCain's worried about a primary challenge. Recent polls show, for instance, that an unusually low percentage of Arizona Republicans approve of the job he's doing. In next year's GOP primary he may have to face Chris Simcox, of Minuteman fame, who might be less of a joke than once thought. That challenge, notes Jim DiPeso of Republicans for Environmental Protection, just might be enough to prevent McCain from being the "spear-carrier" for climate change right now. A second possibility? McCain still hasn't gotten over the 2008 election and is acting out of spite. Recall that in 2001, he adopted his maverick persona and opposed (for instance) the Bush tax cuts after his primary defeat to Bush—according to CQ, his 67 percent "party unity" score that year was among the lowest in the Senate. So it may be now with Obama and climate change. That fits with what many see as McCain's antagonistic streak. "Part of his personal makeup is a suspicion of authority," notes Daniel Schnur, a former McCain campaign adviser and director of the Institute of Politics at USC. Not everyone is giving up on McCain, however. 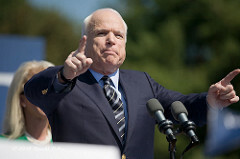 One former Senate aide familiar with McCain’s prior efforts argues that McCain is as committed as ever, but doesn't see himself as just another senator willing to fall in line with Senate Democrats. He wants his ego stroked. "If the president reached out to him and said, 'you've led on this issue for a decade, it needs to happen, what do you need to be in this bill?' I think that would be a thing which he would be engaged on. But so far he's not being asked to be a partner." It's not clear what, exactly, McCain is holding out for, but he could be key to getting a climate bill passed. "Frankly right now as the political momentum slows on this issue," notes the former staffer, "you need the McCain from 2003 to say 'no, we must lead.' "